Bethlehem metropolis (if metropolis is the correct word for this district of about 60,000 people, 2/3s the population of Cambridge my hometown) consists of Bethlehem proper, population 27,000 and two neighboring villages, each with 12,000 residents, Beit Sahour on the east and Beit Jala on the west. 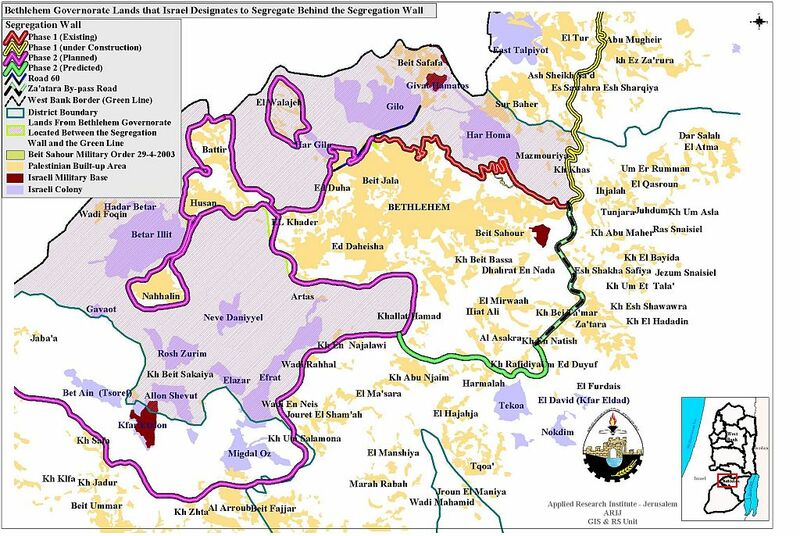 Bethlehem also hosts 3 refugee camps, the largest, Dheisheh, on the south side, occupies 1.5 square km and is home to approximately 10,000 people, Aida in the north near the wall and settlements, with 4000 on a much smaller land base, and a third even smaller camp. Our Cambridge to Bethlehem People to People Initiative visited the two larger camps, and drove thru much of Bethlehem on our wall tour. My solo journey was an opportunity to explore more fully some of the leads and a few of my personal impulses emerging during the group tour. In particular: the 3 shepherds’ fields sites (rule of thumb in the Holy Land: most every historic claim has at least one contender, even the birth site of Jesus—Bethlehem widely accepted, but some scholars suggest Nazareth) and Beit Sahour generally. The first site I explored was the Greek Orthodox Church and monastery, not more than 3 km from the guesthouse where I stayed. It featured archeological excavations, caves, remnants of altars dating back to Byzantium times (around 400 CE), a small chapel underground with an array of skulls of church martyrs (killed during the Persian invasion around 600 CE), glowing lanterns, mosaic floors more than 1000 years old, a lone monk lighting lanterns and washing icons in the chapel, ancient olive trees (one sign declared some trees had lived during the time of Christ), a beautiful and luxuriously outfitted monastery, a huge church with colorful icons, a few workers preparing the church for what I gathered would be Christmas celebrations, a freshly washed tile sidewalk which I inadvertently sullied when I walked on it in my shoes now caked with mud tracked in from the olive groves, and a few markers and explanatory panels that outlined the argument that this was the place. St Helena, Constantine’s mother, was the first Christian to make pilgrimage to the Holy Land. This was in 324 CE or so shortly after her son had declared Christianity to be the state religion of the Holy Roman Empire. She also claimed to have discovered the site of Christ’s birth and crucifixion, and the remnants of the “One True Cross.” As indicated earlier, she is not alone in making claims. The Greek and Russian Orthodox have their claims, the Franciscans theirs, the Protestants theirs, the Malekites and Coptics theirs, on and on. One might wonder, what does this profess about Christianity, or about religion generally? Different marchers to different rhythms. By the end of the 4th century, pious traditions also associate the Shepherd’s Field with the place where Jacob pastured his flock and built the Mignal Eder (i.e., Tower of the Flocks) referred to in Genesis 35:16. The remains of the base of this tower are still visible today. The following story is found in Genesis 35: 9-16…God spoke to Jacob after his return from Mesopotamia, blessing him and naming him “Israel.” He told him that the land He gave to Abraham and Isaac would also be given to him. On the spot where God spoke to him, Jacob erected a stone monument and named it “Bethel.” After erecting the tower, Jacob moved his tent near the Tower of Mignal Eder. When he finally reached Bethlehem, Rachel gave birth with great pain. Next site: Roman Catholic. Less than 1 km north, but in another field, across the peaceful valley claimed as the site by the Greek Orthodox, this seems more visited. I’d been the only explorer at the Orthodox site, free to wander in and out of caves and dark and smoky chapels, but now at this Catholic site, also with its caves, excavations, olive groves, panels, claims, chapels, church, I was among a handful of people wandering the grounds. These Catholics—my former path before I asked questions about papal infallibility, the role of women in the church, sin, and that deadly mortal sin of masturbation—how they tend to dominate everything! No matter, another site, more assertions, an array of beliefs. Both fields were lying fallow for the winter, but looked heavily and carefully cultivated. Groves of trees spotted thru the fields, mostly olives, maybe some fruits. A few fences, a plentitude of modern homes, but I felt an openness and grace here, befitting the important event that may have occurred in this neighborhood 2007 or so years earlier. Surrounding much of the two wadis were the illegal Israeli colonies or settlements, powerful reminders of power distribution. I hadn’t realized how tightly adjacent the settlements were to the Palestinian hillside homes. How different it must have been in those early times. Underlying all this apparent conflict may be a type of unity: something mysterious and inscrutable happened some 2 millennia ago that set much of the world on fire. This signal event, the birth of Jesus, soon to become the Christ, the Anointed One, led to persecutions, state religion, popes, crusades, the Vatican, inquisitions, conversions, priestly transgressions of young boys and girls, the loss of credibility, at least in the States, and me: a wandering explorer, with camera, innocent and sometimes misled, with a few questions: not where did the angel appear, not did the angel appear, but what does this constellation of theory and practice mean to me, to others? Third site: where many Protestants believe the shepherds heard the announcement, about 600 m east of the Catholic site, in the same general topography. I omitted this from my itinerary, not aware until later that this location, the Beit Sahour YMCA, is claimed as the Shepherds’ Field by Protestants. I walked the entire time, the air was balmy, the sun hot, I shed most of the layers I’d wrapped myself in when I left the guesthouse. On the entire journey I met one significant other—a young boy who greeted me when I wandered onto his roof. Yes, the roof, joined to the sidewalk by a few steps, seeming to invite me to stand there to better photograph the first valley. My Arabi is shwey, little, his Englisi likewise, so we smiled at each other and exchanged a few awkward words of greeting. What language did Gabriel use, how did he know the native language, was there any element of miscommunication in their exchange? Scripture is silent on these reflections. Have we misinterpreted the entire Christmas story? How do we best express matters of the heart? How do we surmount differences of language, culture, style, history, rhythm, so that we transcend our confusion and build compassion and wisdom? Do we truly live on One Earth, as One People—or are we consigned to eternal wrangling? And worse. Happy and Joyous New Year..may it continue to nourish the strength of your spirit. Stay safe cousin.. Skip: Thanks for sending this along. Sounds like a wonderful venture from Jerusalem to Bethlehem. The map is particularly interesting. It is the best I have seen depicting the present and future wall. Very useful. Hope your trip continues to be all you had hoped it would be. Engaging story and photos! I appreciate the theme of “many claims” and the way you pull them together at the end–also your challenging, but deeply informed and not disrespectful stance on these matters. Have to admit to wishing to see the site the protestants claim, since that’s where i was situated when, as a young girl I first pictured those shepherds and their journey. I hope many people see this blog and may we all follow the next steps of your journey–into Gaza–with full attention, concern, and prayer (however we claim to do it). the protestant site, as far as i know, is merely the ymca building, no ruins, chapels, markers of any sort for what purportedly occurred here. A small correction: “Greek and Russians have their claims (about Cross)” Actually, fragments of the True Cross are spread throughout the Orthodox lands, and some in Europe since Crusaders stole the relics from Constantinople (1204 ad). Christianity is united east of Europe since Apostles’ times, although Christianity was NOT the state religion, but “preferred”… Since the Resurrection was an incredible event remembered by eyewitnesses into 2nd century, the Tomb, Gethsemane, etc were carefully honored as places where “God walked upon the earth”. St. Helena discovered 3 crosses on hill of the “skull” (now encompassed by Basilica of Resurrection in Jerusalem), and applied fragments of each to one who was terminally ill. The true Cross of Christ healed the sick one (perhaps dead?). Just several years ago, an elder from Mt. Athos visited Russia (1980’s before wall fell), and the crowds prevented a clear view – the relic of the True Cross raised Itself above the crowds in a spectacular miracle – still spoken about in Russia. Miracle of the Holy Light on Saturday before Pascha (“easter”) Sunday comes to signal the truth of His Resurrection.